London Airport Biggin Hill (IATA: BQH, ICAO: EGKB) is an operational general aviation airport on Biggin Hill in London’s Bromley district, located to the southeast of central London. The airport was formerly the Royal Air Force Station of RAF Biggin Hill, and a small enclave at the airport still retains this designation. The airport has a license (number P804), which gives the right for passenger transportation and for flight training. The airport is mainly based on general aviation, as well as business aviation. The airport does not serve any regular passenger lines. Biggin Hill is a glorious military past: it gained fame due to its role during the Battle of Britain during the Second World War, when it served as the main defensive base of London and South-East England from enemy bombers. At the airport there is a passenger terminal, where the departure zone, cafeteria, customs and immigration control are compactly located. 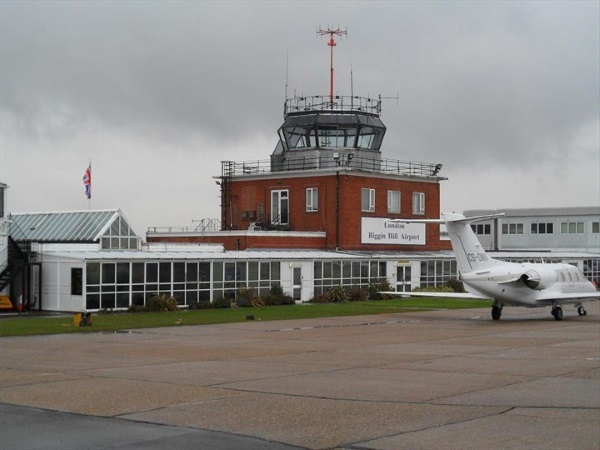 Century anniversary marks in 2017 one of the oldest airports in England – London Biggin Hill Airport. This date will be the starting point in the implementation of a new, ambitious project to develop it. Make BQH the main London “gateway” business business aviation – this is the goal set by the administration. Today, a new all-season hangar is being built for six G650 airliners. And ahead – a large-scale change of the entire infrastructure of the airport. In addition to the hangar, it is also the construction of a modern office, a significant increase in parking spaces on the apron, the modernization of the hotel complex. All this became possible due to the ever-growing popularity of Biggin Hill among customers, as only last year it received more than 14,000 aircraft.